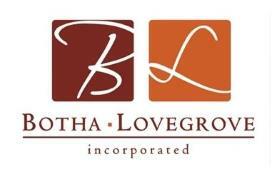 Botha & Lovegrove attorneys and conveyancers is a dynamic law firm comprising of lawyers who provide professional legal services to individuals, foreigners, associations, private and public companies. Our major client base includes institutional and corporate clients who wish to draw upon the recognised expertise our firm possesses. Our experience in different legal fields. The professional and high standard of our work. Offering, innovative, practical and cost effective services by combining transactional and dispute resolution skills with legislation and regulatory capability. We believe in strengthening our knowledge and resource base by attending regular seminars and providing training on a frequent basis to all employees. Good working relationships with our clients are our aim and we strive to ensure that working with us are a positive experience for them.